Calming earth tones sooth in elegant low-key style. Located in a vacation home in Long Beach Island, this master bathroom is one of two en-suite baths on the second floor. “Selections were based on more organic elements that blend with the contemporary aspects of the home and less on traditional beach-themed products,” says interior designer Lori Levine, principal of Lori Levine Interiors in Basking Ridge. 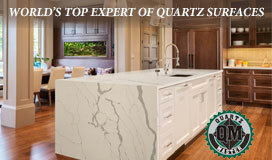 White quartz countertops balance the movement and tones in the custom European walnut veneer cabinetry. “The homeowners wanted lots of texture and loved the idea of mixing different elements together” in the soft and serene space, Levine says. The make-up chair, upholstered in a pearlized vinyl fabric, is easy to keep clean and antimicrobial, Levine says. 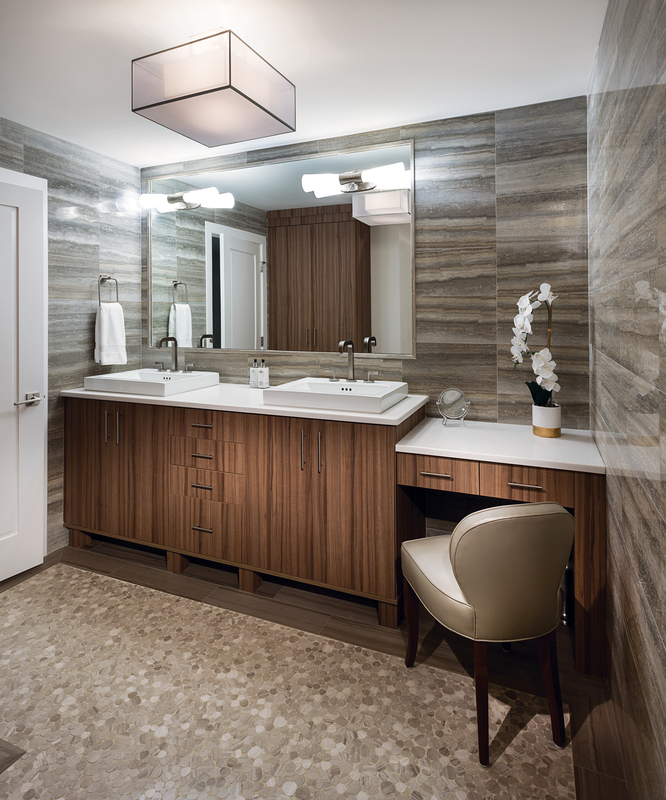 Veined travertine wall tiles wrap seamlessly around the room and into the walk-in shower (not pictured). The bathroom has a separate area with a stand-alone tub and a toilet room accessed through pocket doors. Levine used pebble tiles bordered by ceramic planking to create a “path” where one area reveals itself to the next around the almost S-shaped footprint. With limited natural light, it was important to add a variety of decorative and functional lighting, Levine says, noting that she mirror-mounted the sconces to help reflect the light. Visible in the mirror is a tall built-in linen press for easy access to fresh linens and towels. Interior design, Lori Levine Interiors in Basking Ridge; custom cabinetry, Sage Design Studio LLC in Chester; plumbing fixtures, Ferguson Bath, Kitchen & Lighting Gallery; floor and Ocean Blue travertine wall tiles, Mediterranean Tile in Bernardsville; ceiling light, Fine Art Lamps; sconces, Circa Lighting.